It doesn’t matter now the industry in which you are working as each and every business on the earth needs to have the virtual existence in the form of a website. 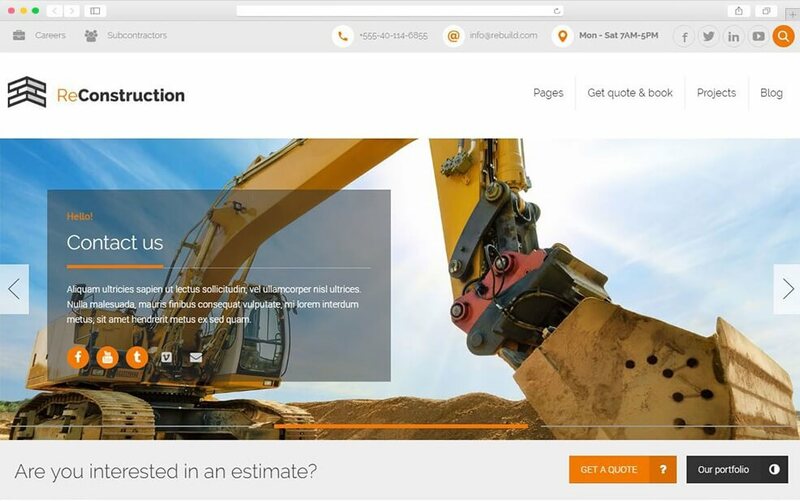 Even construction companies need a website in this modern world wide web era. 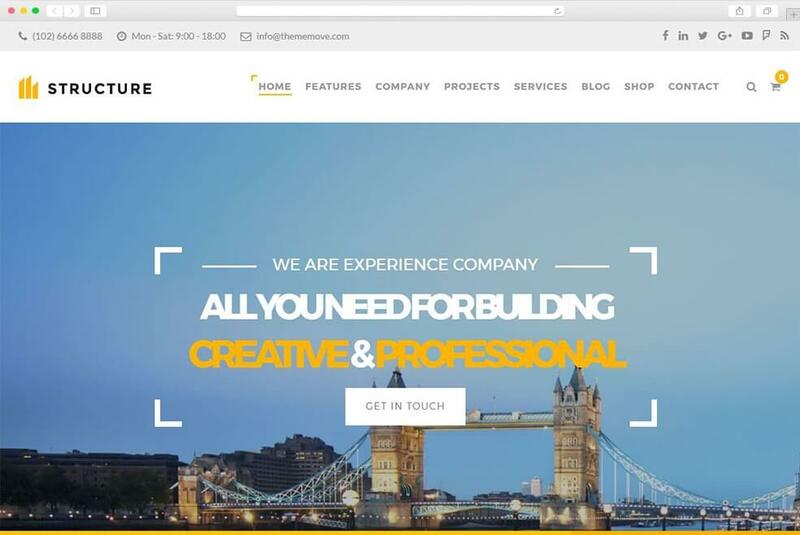 Here are the most appealing WordPress construction themes that can be used by the construction companies for online presence. 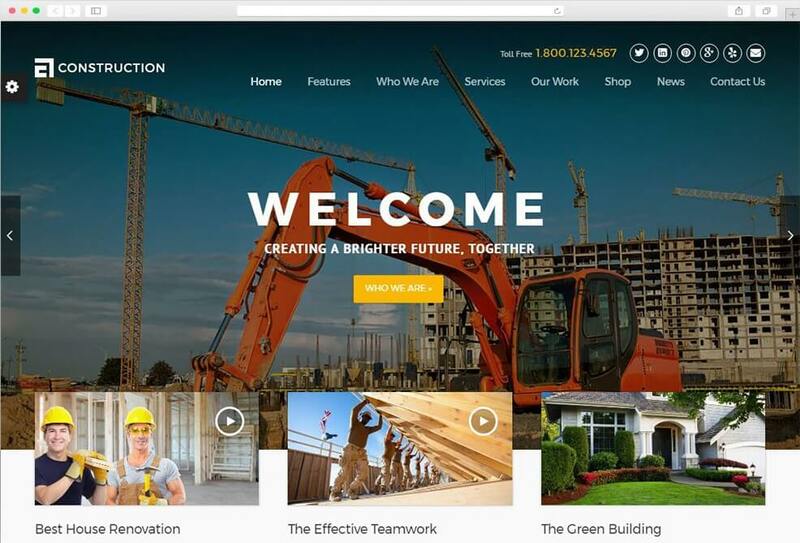 All of these themes have all the options and content that a construction company would like to show to its customers. 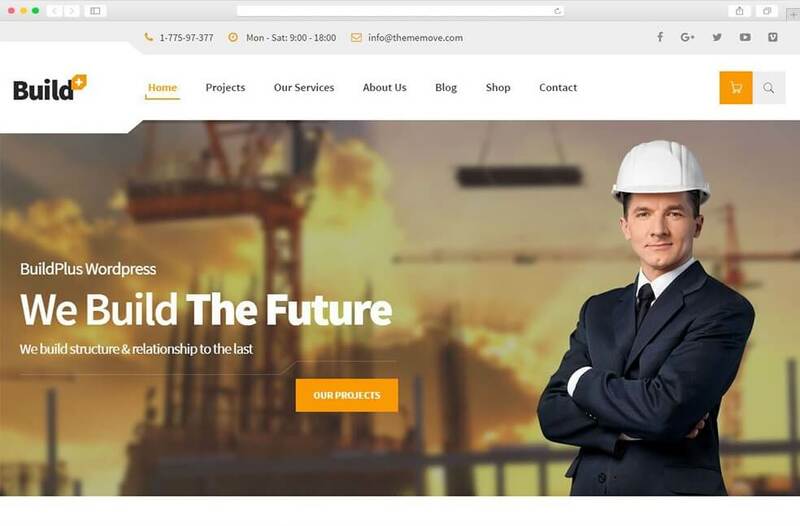 It is very easy to create a complete construction company website using any of these modern construction WordPress themes. All the themes have rich customization options in the admin panel. They look absolutely stunning on all screen sizes including the tablets and small devices such as mobile phones. These themes are completely compatible with all of the browsers. 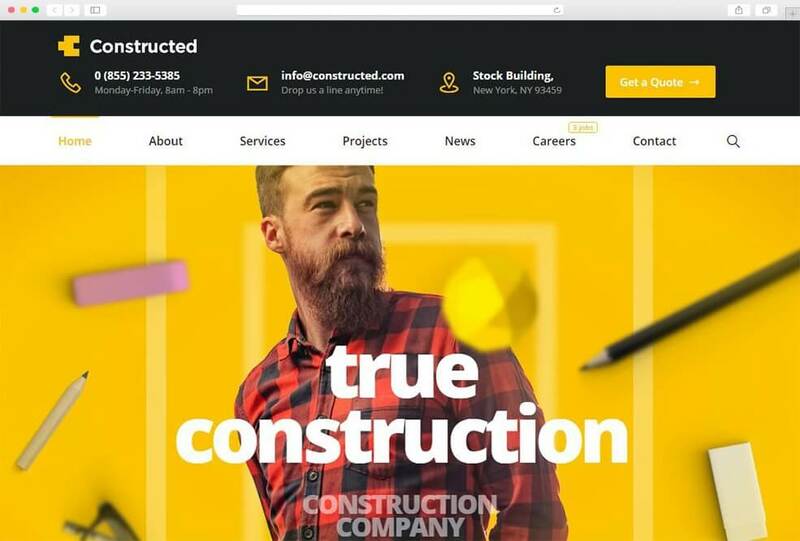 Get started with your next construction company website with these beautiful WordPress construction company themes. 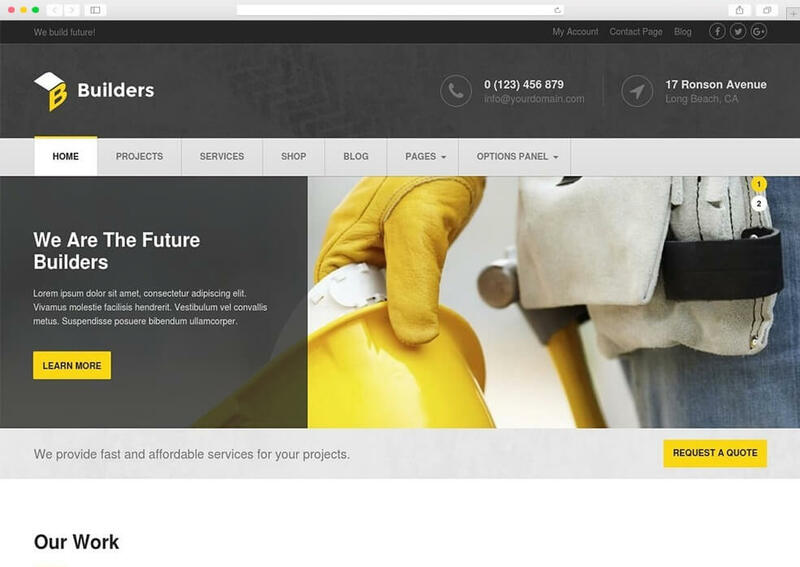 Builders is one of the best WordPress construction theme available out there and it is designed specifically for the construction industry. This theme comes with the 12 ready-made page layouts and it is completely responsive. The theme also includes the PSD files so that design changes can be made possible. The theme is fully customizable and it comes with super fast loading speed. This theme is Adsense ready for construction and real estate bloggers for earning through Adsense. It is SEO ready theme making it the best choice for your construction company website. This theme is very suitable for any sort of construction, plumbing, painting, tiling, refurbishment, partitions & ceilings, plastering & rendering, carpentry & joinery related business. It has 13 ready made page layouts and you can use the one that best meets your business needs. The theme comes with the fully responsive layout and it is compatible with all the browsers. The PSD files, premium plugins, font designs and graphics in the package make it a valuable deal. It has amazing project showcase layout that you can use to show your portfolio to the potential clients. Construction WordPress theme makes it easier for beginners to develop a complete construction company website. It has a large number of pre-made pages and it comes with three different header styles. 600+ Google fonts, revolution slider, and visual composer are included in this valuable package. This theme has big options panel from where you can control and customize each area of the website. The theme is WPML supported and translation ready. You can install the demo content with one click and save lot time from creating all the pages from scratch. The theme is SEO ready and cross-browser compatible. 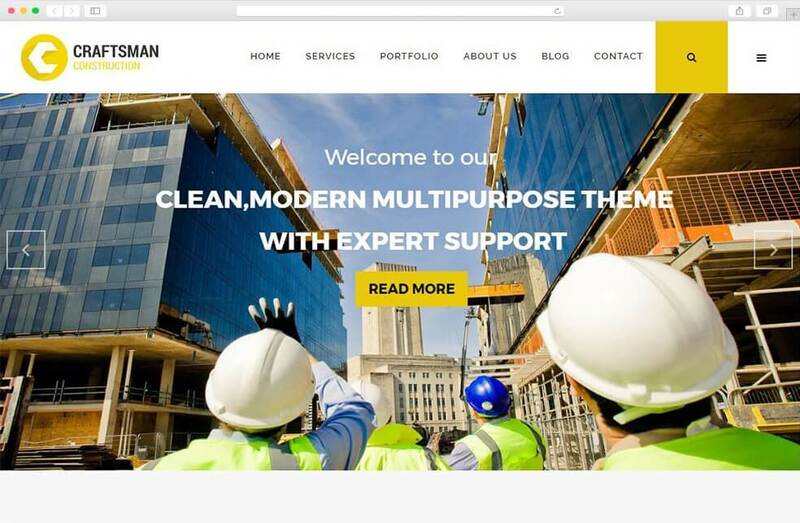 This theme is specially designed and developed for construction companies, builders, engineering and cleaning companies and it has all the features that such companies are usually looking for on their websites. 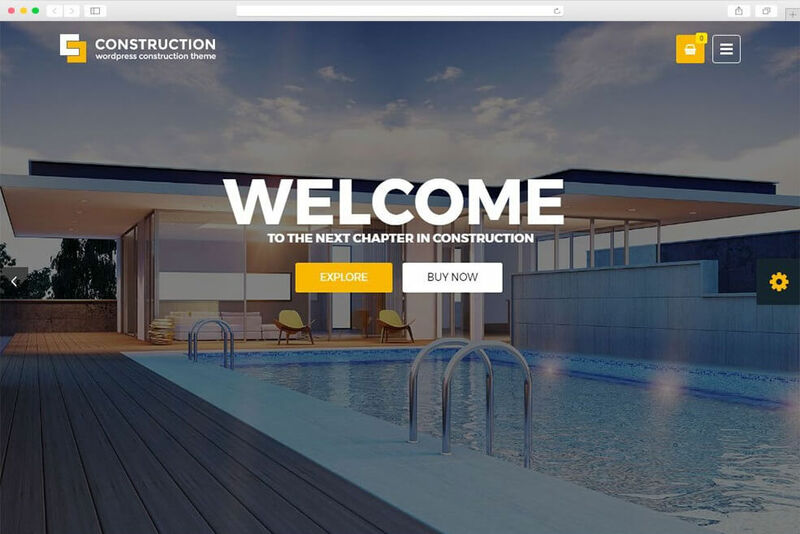 The construction theme comes with endless possibilities of layouts and it has a large number of pre-designed header and footer layouts and you can choose the best that meets your needs. The theme is super-fast loading and makes your website perfect for search engine optimization. The 600 Google fonts have been added to the theme to make your website text look stunning of all sorts of layouts. The theme is SEO friendly, translation ready and comes with one click demo installation functionality. 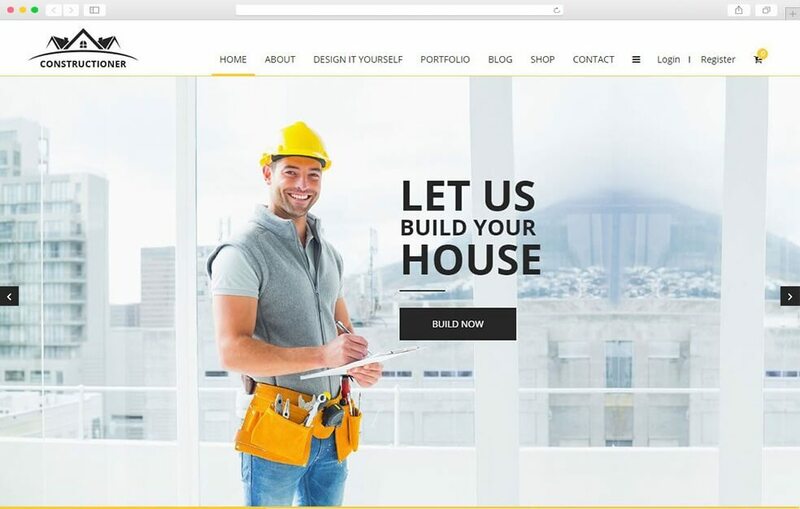 WP construction is a powerful WordPress theme designed exclusively for construction companies and it comes with the best drag and drop builder Visual Composer. This powerful theme has one-click demo installer and one-click theme updater. Many premium plugins have been included in the package like Visual page builder, Revolution slider and essential grid saving you more than 70$. The support for this theme is amazing and it comes with powerful admin panel and 600+ Google fonts. It is fully responsive and all browsers compatible. 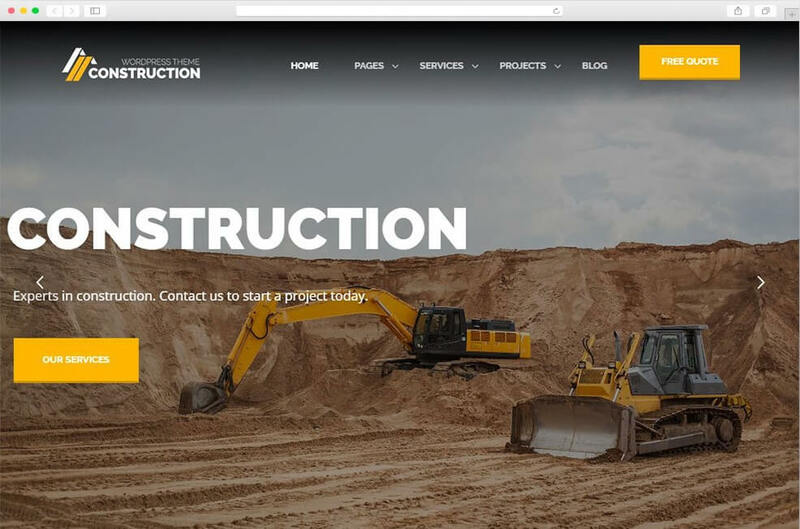 Construction is a business WordPress theme for construction companies and it comes with free Visual Composer, revolution slider, and Woo commerce support. The theme has a full video tutorial for customization and also it comes with detailed documentation. The theme is fully responsive, translation ready and it has a powerful admin panel to ensure effortless customization. Craftsman construction theme comes with a unique and fully responsive design. The theme is powered by a visual page builder so that you can design your own layouts. The powerful admin panel is included in the theme to make customization process easy as you like. Plugins like visual composer are included in the package valued at 50$. Some other features of the theme include responsive design, retina ready, translation ready, SEO friendly, browsers compatible and much more. Construct Pro is the clean construction and business WordPress theme that comes with powerful admin panel and one-click demo install function. The theme is responsive and cross-browser compatible. Premium plugins like visual composer and revolution sliders have added in the theme for free. The theme has detailed documentation and powerful admin panel. 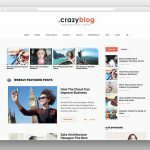 The theme supports WPML and it comes with multiple layouts. 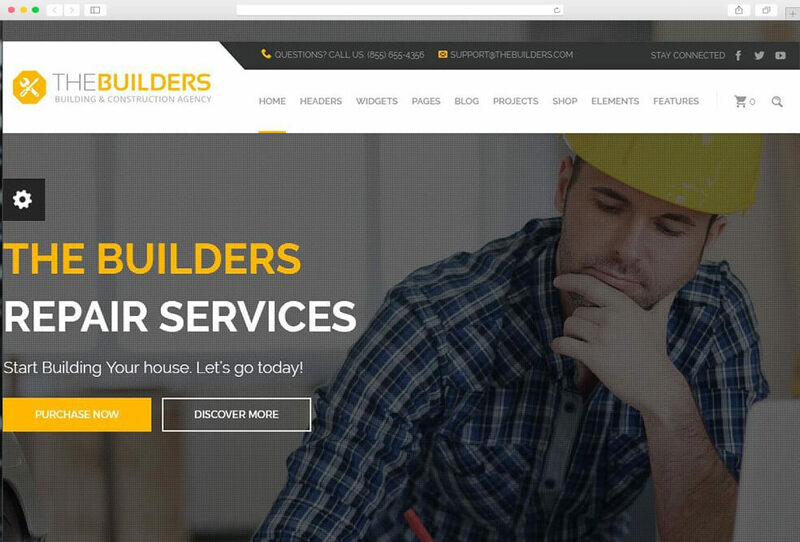 The Builders is responsive, retina ready and an impressive construction WordPress theme which comes with powerful admin panel which makes its management and customization very easy. The package includes the free visual composer and other premium plugins. 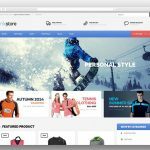 The theme supports WMPL, Woo commerce, and parallax effects. There are many pre-made layouts and the theme supports multiple page title sections. PSD files are also included in the package for design customization. 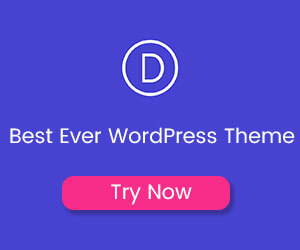 The theme has both one-page and multiple page versions and it has multiple header layouts that you can choose to make your website unique as much you can. 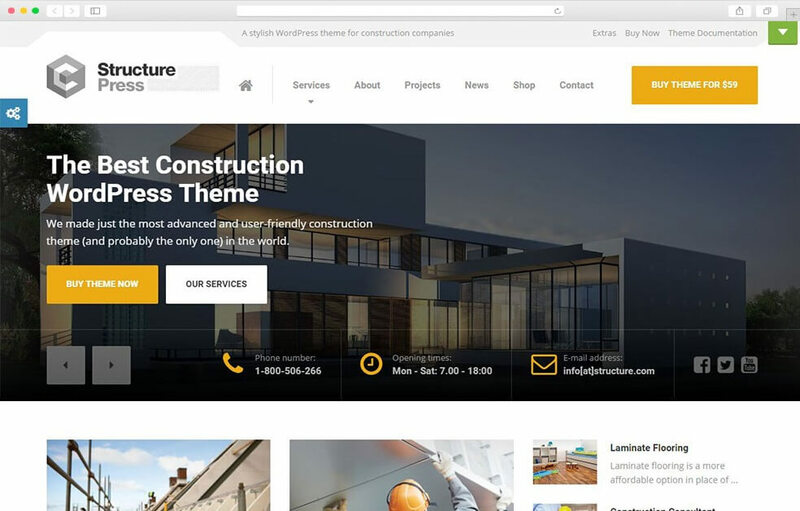 Structure is the responsive WordPress theme for construction companies, builders, and engineering companies. It has all the basic elements essential for a powerful construction business websites. The Structure WordPress theme has 15 homepage layouts and you can choose for your website which meets your business needs. The supports the Woo commerce and it has been integrated with the Visual Composer the best drag and drop builder for the WordPress opening the window of countless designs and layouts for you. Templatera, contact form 7 and MailChimp are included in the theme package. 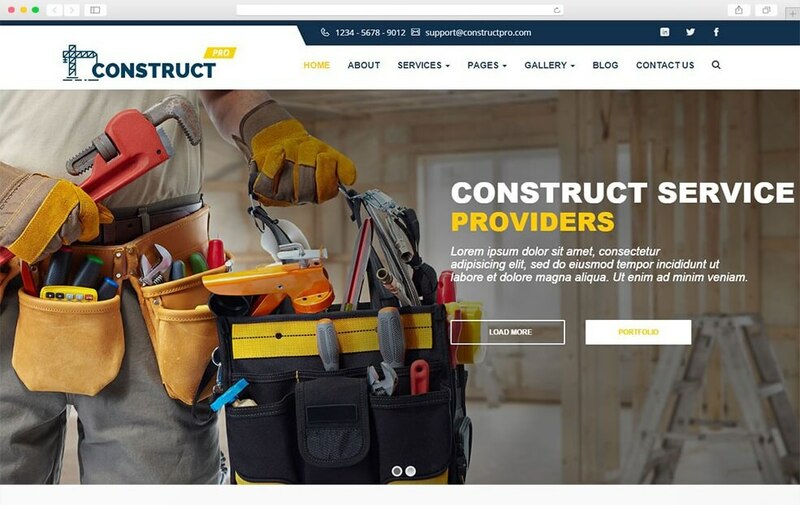 Construction is the unique, modern and responsive WordPress theme for builders and construction companies. The theme has intelligent options panel from where you can customize the website with ease. 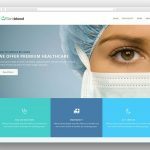 The theme is included with the Visual Composer to help you design your own layout with the drag and drop function. The theme has multiple homepage layouts, portfolio layouts, 3 blog layouts and unlimited colors. The theme is fully responsive and browsers compatible. Demo data is included which can be installed with a single click from the admin panel. 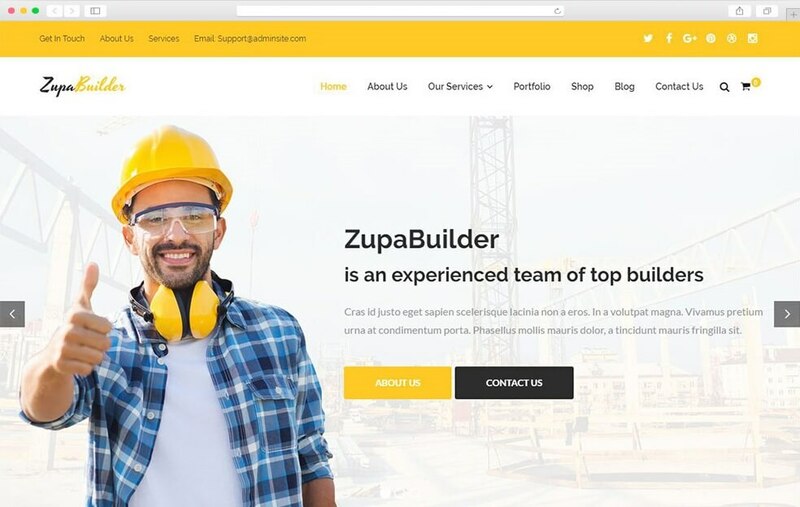 Zupa is the responsive and clean WordPress theme for builders, construction companies, and construction related businesses. The theme has twelve beautiful designs for the homepage. You can save big as premium plugins like Visual composer; Visual composer extensions and revolution sliders are included in the package. The design looks stunning on all handheld devices and screens of all sizes. The theme has handy options panel for easy customization. 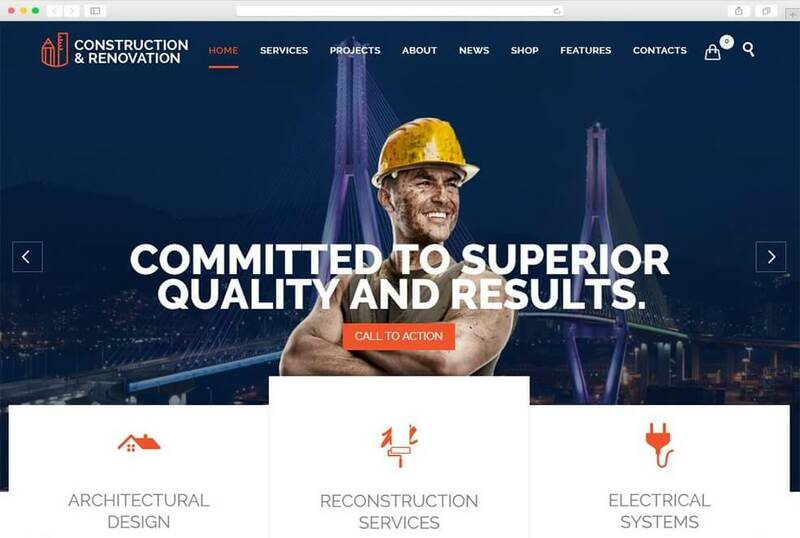 Reconstruction is a powerful WordPress theme made with primary focus on construction companies and builders. The best thing about this theme is the quote calculator which can be customized according to your business needs. The theme is fully responsive and retina ready and integrated with a rich theme options panel. There are unlimited layouts available to showcase your best work and portfolio. The theme has four header layouts including a sticky header. The theme looks fabulous on devices of all screen sizes and it is translation ready theme with one click demo install function. BuildPlus is an amazingly crafted, responsive and retina ready WordPress theme for construction related businesses. It can be used by engineering, builders, and related businesses. The demo content installation is very easy and super-fast as you just need to press a button and your website is free. The home page has multiple layouts and you can choose that best meets your needs and requirements. The theme has a control panel with many options that make theme customization much easier. The theme has unlimited color options available and it comes with lots of shortcodes to make theme customization effortless. StructurePress is a beautiful, clean, and responsive and retina ready WordPress theme designed for construction and architecture companies. It can also be used by the home building, renovation, and gardening related businesses. 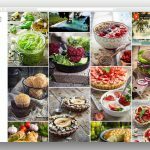 The theme has easy to use page builder which you can use to build your own custom layout for the pages. The theme has built-in forms, custom widgets, and free Visual composer, free PSDs and built-in multilingual support. It has the real time customizer which can be used to edit the website from the front end. You can get started quickly with this theme by one-click demo install facility. Real Construction is best choice for construction, building, architecture, or engineering company sites. It is responsive, fully customized and WooCommerce compatible theme.